How to build a better snack. To keep you feeling full and satisfied, a snack should provide a balance of good carbs and either protein, fat, or both. In other words, eating just a few carrots won't sufficeâand neither will many granola bars. Read (and pin!) our list of perfect anytime snacks. Antioxidants galore, thanks to the fruit, plus hunger-busting nuts. Get them in the shellâit'll slow down your eating. Cynthia SassÂ is a nutritionist and registered dietitian with masterâs degrees in both nutrition science and public health. 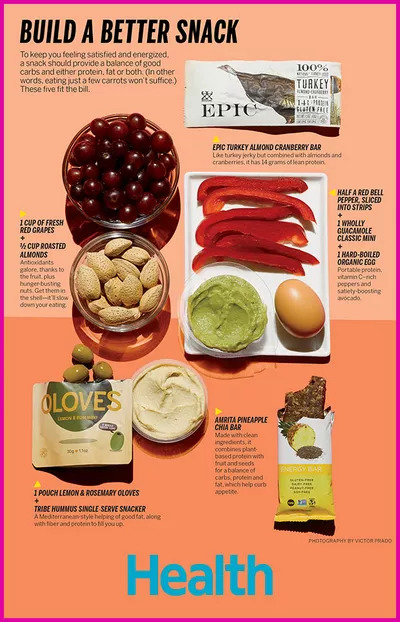 Frequently seen onÂ national TV, sheâs Healthâs contributing nutrition editor, and privately counselsÂ clientsÂ in New York, Los Angeles, and long distance. Cynthia is currently the sports nutrition consultant to the New York Yankees, previously consulted for three other professional sports teams, and is board certified as a specialist in sports dietetics. Cynthia is a three-time New York Times best-selling author, and her brand new book is Slim Down Now: Shed Pounds and Inches with Real Food, Real Fast. Connect with her onÂ Facebook,Â TwitterÂ andÂ Pinterest.